This document is the installation manual for LIBPF™ (LIBrary for Process Flowsheeting) models version 1.0 on desktop and laptop computers running the Apple OS X operating system. It addresses model users: people who want to install the user interface (UIPF) to interact with models developed by others. LIBPF™ User Manual for how to use models developed with LIBPF™ and the LIBPF™ user interface. NOTE: Even if the application can be started by any user, for the activation to succeed administrative access is required. 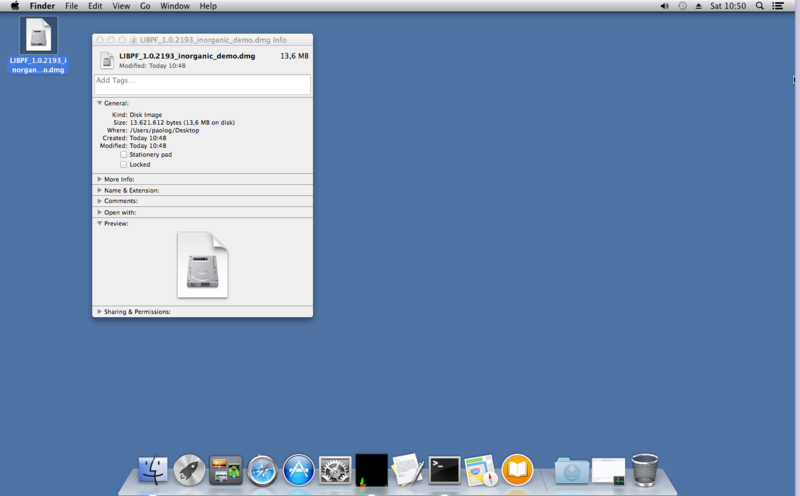 Double-click on the supplied dmg file: the system will verify it, mount it as UIPF volume and open its content in a Finder window; note the mounted UIPF volume appears on the desktop with a removable drive icon. At this point review the kernel license (if present), the LIBPF™ library license and LIBPF™ user interface license. For a quick test you can start the UIPF (User Interface for LIBPF) application directly from the mounted volume. 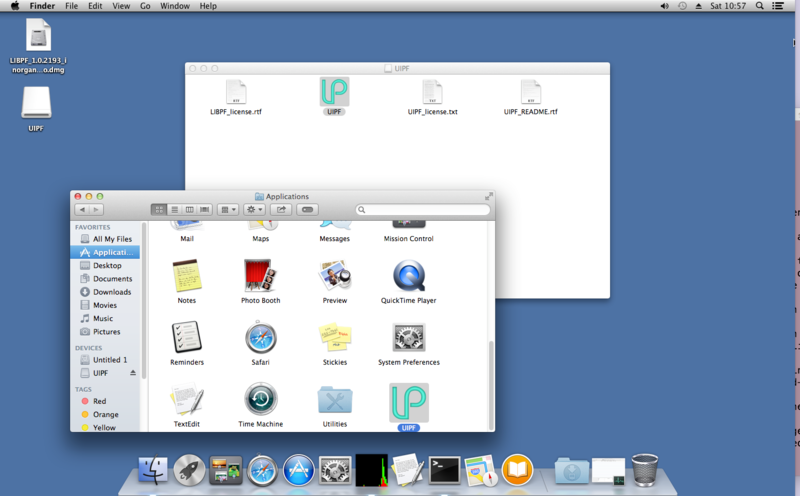 If you plan to use the program frequently, it is advised to copy the UIPF application package to the Applications Folder. At the end of these steps, don't forget to Eject the UIPF volume by performing a right-mouse-button click on it and selecting "Eject". To uninstall the LIBPF™ model, remove it from the Application folder. 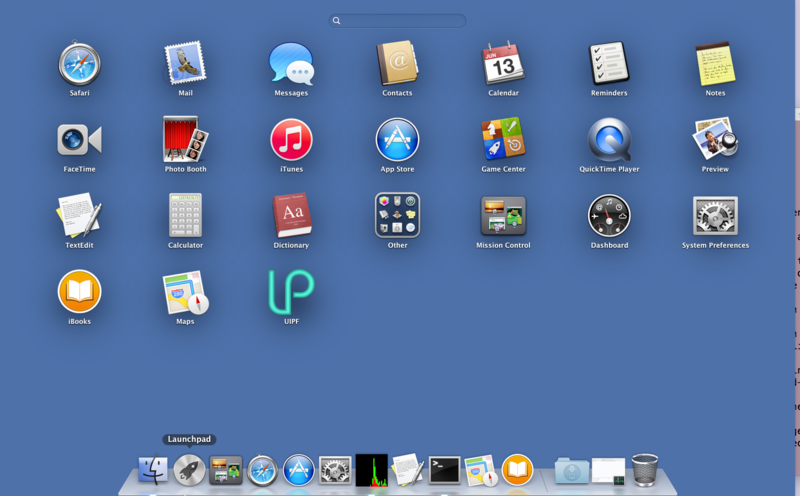 When the removal is complete the LIBPF 1.0 item disappears from the list of installed programs in Launchpad. NOTE: at the end of the removal process, the only data that will remail on your computer after uninstallation is the activation data: in this way, if you ever reinstall the same model or another one which shares the same activation data, you do not need to repeat the process. If you wish to remove the activation data, just delete the file /Library/Preferences/com.libpf.LIBPF.plist. When starting calculations, licensed LIBPF™ models will check if they have already been activated on that specific workstation. For further information please refer to the LIBPF™ Activation Guide document.